Constrast her account with this - a call for a measles party! personal footnote: my 30 year old niece, healthy, top fit, half marathon runner, has been coughing for 102 days from whooping cough (and counting) now. This is not a harmless disease and it has the nickname "100 Tage Husten" (100 days cough) for a reason. The content is still a bit disappointing, cannot say the info is "updated". It consists of links to old "The Vaccine Book" (dead link) blog posts, mostly sans comments (big shame, since there were some beautiful ones in there by SM and me). This is not really suitable as an info site (yet) especially since posts don't have date stamps or corrections (no, the return of single measles, mumps and rubella vaccines is not planned for 2011, at least not according to Merck). The "purchase the vaccine book" link works (not surprisingly). I would advise against it. "My child is two years old and I am sure we had done all first year vaccines, but now we got called back for XYZ shots"
"I got a letter from the State saying that my child is not up to date, but s/he is"
You have to keep a record of the vaccines your child get! that you get to keep. 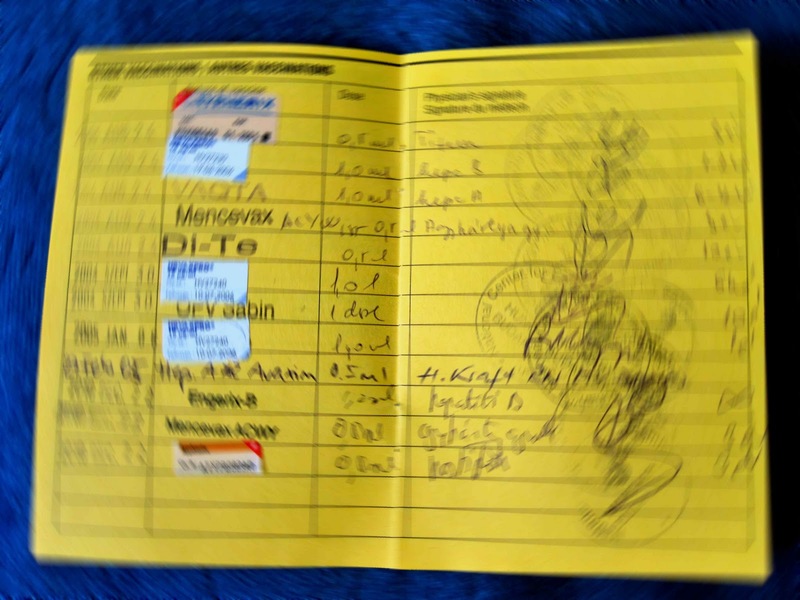 I have encountered such "best practice" with our second child - our first had 3 cards, one for each country she got vaccinated in, until we combined them into one. 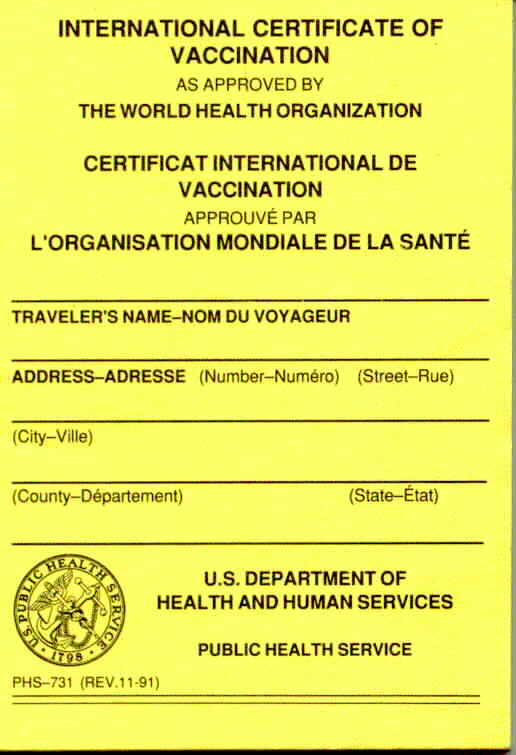 It is surprising, however, how often parents do not automatically get vaccination records to take him with them. However, you need such records, so if you move or change doctors, you have proof of which vaccinations your child has had. These "Yellow Cards" exist world wide (the upper picture is an Ugandan one filched off the web, my daughter has one from California, my son one from Germany), they have been around for a really really long time - I have one, my original one is white though and I recently found my mum's and grandma's (proper record keeping during WWI and WWII, although mainly for smallpox). It is even more important to keep your records if you are on an "alternative" schedule (for any reason - the European schedule my daughter had been vaccinated on for her first 9 months was very much "alternative" to what was recommended/required in the US). As soon as your child is born, you can make up a vaccination schedule for him/her - the CDC has a handy tool, or find your country's National schedule and do it by hand. If you want to diverge from what is recommended, highlight this on the schedule. Take the schedule in to your doctor's appointment to double check you have done it right. Ask for the yellow card and then keep track of all shots. Also make sure that all vaccines are actually available in the combination that you want to give them - there are still parents out there who want to give monovalent measles, mumps and rubella, but they are no longer made by Merck - there are also periodic shortages in vaccines (in recent years for example the monovalent hib). It needs a little planning, but it is very valuable, and, ultimately, your responsibility. 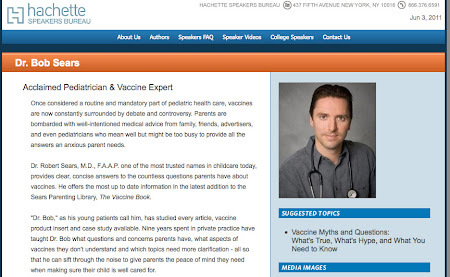 Bob for hire...suggested topic "Vaccine Myths and Questions"
Once considered a routine and mandatory part of pediatric health care, vaccines are now constantly surrounded by debate and controversy. Parents are bombarded with well-intentioned medical advice from family, friends, advertisers, and even pediatricians who mean well but might be too busy to provide all the answers an anxious parent needs. Dr. Robert Sears, M.D., F.A.A.P. one of the most trusted names in childcare today (1), provides clear, concise answers to the countless questions parents have about vaccines (2). 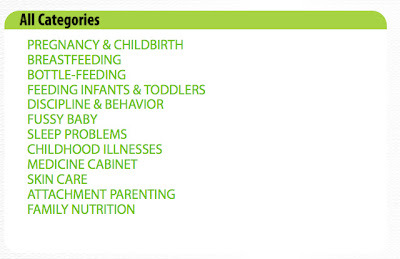 He offers the most up to date information in the latest addition to the Sears Parenting Library, The Vaccine Book (3). "Dr. Bob," as his young patients call him, has studied every article, vaccine product insert and case study available (4). Nine years spent in private practice have taught Dr. Bob what questions and concerns parents have, what aspects of vaccines they don't understand and which topics need more clarification - all so that he can sift through the noise to give parents the peace of mind they need when making sure their child is well cared for (5). Dr. Bob does not tell parents which decision is right for them, he simply gives them the information and the tools they need to make the right decision for their particular child and situation (6). Dr. Bob is a board-certified pediatrician in practice with his father, William Sears, M.D.. and the co-author of several books in the Sears Parenting Library (7). He lives in Dana Point, California. (1) actually, I would doubt that - Sears maybe, but that is Sears the elder, or Sears the brand, not Bob. (2) I wish I had saved more of his posts from his board. Dr. Bob often either didn't answer, or totally hand waved his replies. He often suggested that parents with children with ASD, AD(H)D, or sensory and/or speech issue not be vaccinated at all, without a clear rationale (gut feeling, extracted rectally?). (3) The Vaccine Book appeared in 2007. (4) I wonder why he would still make totally outlandish claims then. Recently, he told the mother of a 7 months old ex-preemie to rely on maternal immunity after measles exposure, which isn't really a testimony to his knowledge in the field. (6) Yes, right, he instead pulled the "I tend not to vaccinate in this kind of situation, but of course it is totally your choice..."
(7) ...books which are no longer mentioned in his family's web shop. (8) Bob's alternative schedule has never been tested for efficacy or safety. On his board, he appeared generally unaware of studies on alternative schedules (e.g. the Swedish schedule). His ideas on MMR efficacy were totally evidence-free. The bold is, of course, as bold as it is wrong. I am not sure whether I should laugh or cry - the decline of Andrew Wakefield into this scene, down (I guess) from the Anti-Vaccine movement, deeper into the anti-science realm of conspiracy theorists is both consequential and kind of sad. The CDC published the Vaccination Coverage Among Children in Kindergarten United States, 2009/10 School Year in the June 3 issue of its MMRW today. Some media outlets picked up the news that Washington has highest vaccine opt-out rate in country. Over 6% of Kindergartners have an exemption for one or more vaccines. While that doesn't seem much at first glance, it does push vaccination coverage at an age where kids are very likely to spread disease under the level that is assumed to be needed for herd immunity. Ironically, in the same issue of the MMWR, the CDC reports two cases of rubella in Washington, one imported, one indigenous. Honestly? I wonder what sort of false eco-nostalgic ideals Washingtonians are striving for, but is it really those times when hundreds (thousands in epidemic years) of babies per year contracted rubella in the womb and died in utero, or were born with horrendous malformations, deaf, blind, with heart defects?! Vaccine exemptions lead to disease outbreaks - this is a small example. I wonder how many larger and much more catastrophic examples it will need for some parents to clue in? So following my recent post about that paper by Miller and Goldman, which crudely correlates numbers of recommended vaccines with infant mortality rates in the US and any country with a lower IMR, I got mail. Gary Goldman wanted to discuss my criticism with me and explain why they were still right. He actually wanted me to call him, which I was initially tempted to do, but eventually didn't because I was put off by the twisting and turning email conversation. He did request that I keep our exchange private, however, he stopped writing me, so I thought I'd just bring one argument up here and see whether he will answer. I see that you are avoiding the most obvious question: why are there fewer and fewer infant deaths when more and more vaccines are given? I gave you the German numbers, where infant mortality dropped by 80% while the number of scheduled vaccines tripled. Every country I look at has the same temporal trend, although in the US it is not as pronounced as in Europe, most likely because of your crappy health system. I would really like to know what your thoughts on this are. I notice you are still avoiding the historical question and if I may make a prediction - you are going to avoid answering this question forever. I would really be interested in your reasoning. studies, more longitudinal, and in other populations are reasonably necessary to support the present trend we report. I am not able to address the specific historical factors concerning infant deaths in Germany upon which you rely to support your contention that no correlation exists. Germany is, of course, not the only country in which infant mortality plummeted over the past 30 years, it did so in every developed country I looked at. I have seen data where 90% of disease mortality declined prior to vaccinations and this was largely attributed to improved sanitation, nutrition, and water. Yes, all anti-vaccine protagonists like to refer to such curves. However, I am not talking about disease mortality, and I am talking a period of 1981 to 2011, when sanitation, nutrition and water were not a problem at all in Germany (or any of the other developed countries in which infant mortality dropped over the same time period). Other studies, more longitudinal, and in other populations are reasonably necessary to support the present trend we report. But Gary, we already know that infant mortality plummeted while the number of vaccines was significantly increased. I don't think that the kind of crude and error/bias ridden correlation that you have published advance the field at all, or reasonable raises new questions. What about you? What experiences have you had that have shaped your thinking and views? Misrepresentation of scientific evidence and dodging of straight forward questions by anti-vaccinationists for example - you wrote many many words, totally side tracking - we were talking German vaccination schedule and how it is not what you wrote about - you have similar misrepresentations for other countries as well - then you write about varicella, which is a second year vaccine - this was not the topic at hand - and you come with "sanitation" when we are talking 1980ies Germany - that is rather lame, you know. So, given that Germany had great sanitation in 1981 and we are talking infant mortality, not disease related mortality, and they had 9 recommended vaccine doses and 10'000 infant deaths then, while they have 21 to 28 recommended doses and under 2000 infant deaths now, how would number of recommended vaccines correlate with infant mortality at all? Can you give me even an idea, a reasonable notion how your idea would match, umm, reality? Infant mortality rates in all developed nations, including Germany, were much higher in the 19th and early 20th centuries and have continued to decline mainly due to improvements in nutrition (including breastfeeding advocacy), sanitation, and access to healthcare. [This information is not a conspiracy of "anti-vaccine protagonists" as you suggest; it is well-documented in the medical and historical literature.] For example, nearly 300 per 1,000 German infants died in the mid 1800s. By 1950, the German IMR had dropped to 52/1,000—an 83% decline. By 1960, the German IMR had dropped another 33% to about 35 infant deaths per 1,000 live births. These dates and declines in IMR preceded the extensive increases in compulsory vaccinations required of German infants. Furthermore, Germany’s IMR declined at a rate of 3% annually from 1960 to 1979 during a time when few infant vaccines were required. This rate of decline was much faster than the 2.4% annual "plummet" from 1980 to 2009 during a period when more infant vaccines were required. Additionally, Germany and other developed nations continued to make medical advances at reducing neonatal mortality during periods of increasing vaccine requirements. For example, from 1970 to 1979 there was a 41% decline in U.S. neonatal mortality. From 1980 to 1989, there was an additional 27% decline in neonatal mortality. Neonatal mortality (deaths in the first 28 days of life) usually accounts for more than 50% of all infant deaths. From 1990 through 2010, neonatal mortality in Germany represented about 68% of all infant mortality. During that period, Germany’s neonatal mortality rate had declined by 55%. Such improvements to the neonatal mortality rate greatly reduce the infant mortality rate yet are unrelated to the number of vaccines administered to infants. so if I understand you correctly, infant mortality is dependent on all sorts of factors (hygiene, nutrition, sanitation, access to health care) and still declining, but just not as fast as it would be if we didn't vaccinate. Despite all these factors, which obviously vary tremendously between countries, you decided to only crudely correlate vaccines to infant mortality? Vaccines dumped from new Ask Dr Sears website? 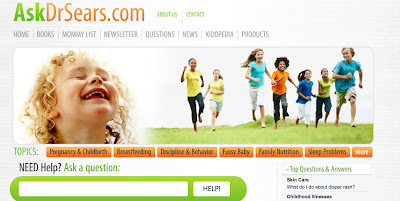 I just caught a glimpse of the new Ask Dr. Sears Website. It was terrible slow loading when I first saw it, but the the landing page was all re-structured and modern in nice greens and oranges (I like that, very purdy). and on the middle all categories bar, there were no vaccines. but they certainly had been there on the old page. 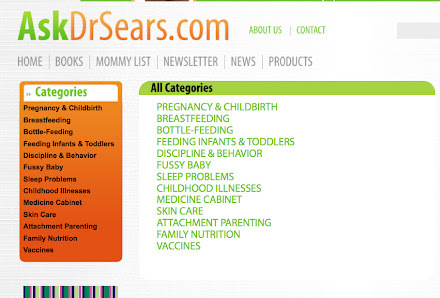 I wonder whether this is going to be amended, or, whether in a year of pertussis and measles outbreaks that have cost 10 infants in the Sears' home state of California their lives, and have put many kids in hospital, the Sears have decided to drop this potentially contentious part of their web presence. In any case - since the Sears' vaccine book discussion board has now disappeared, I hope you do have a good doctor and I can recommend our forum and, if you want a bit of a mixed audience, also the Immunization Discussion forum on Babycenter - see you there!